Russia to deal with WTO conflict with vehicle utilization fee in fall 2013 at the earliest. Russia has received notifications from China, the United States, Turkey, Ukraine and Japan about joining WTO consultations on the vehicle recycling fee, a source close to the negotiations told Prime new agency. The European Union and the countries that have joined it in complaint oppose the special duty imposed on vehicles imported into Russia, which was introduced in September 2012. The fee — proposed by President Vladimir Putin and intended to pay for the recycling of vehicles — amounts to 20,000 rubles (around $600) for cars and 150,000 rubles ($4,500) for trucks and buses. The introduction of the fee coincided with a reduction of import duties on passenger cars, from 30 percent to 25 percent under the WTO rules. Russia is going to cut the import duty to 15 percent over seven years. The Russian side has agreed to impose the recycling fee on Russian auto manufacturers too, placing them on equal footing with importers. Still, the relevant amendment will not be introduced before fall, when the Russian parliament reconvenes after its summer break. If Russian auto manufacturers are required to pay the recycling fee, state coffers will receive an additional 150 billion rubles ($4.6 billion) or so. Vladimir Putin proposed the fee in April 2012. While importers have been required to pay the fee, Russian auto manufacturers have been allowed to offer recycling guarantees instead. The European Union was quick to protest, claiming the fee was against WTO rules. Russian officials responded by promising to extend the fee to everyone, effective July 1, 2013 at the latest; the government introduced the corresponding amendments to the Duma in late May, and the parliament will discuss them during its fall session. The United States reported to the WTO that, between September 2012 and May 2013, the fee was imposed on $1.25 billion in exports, or 10 percent of total U.S. exports to Russia, Reuters reported. The European Union complained that €10 billion ($13 billion) worth of exports to Russia was suffering from the fee annually. While Russia has agreed in principle that the recycling fee should be equal for domestic auto manufacturers and importers, implementation will take time, Russia’s ambassador to the EU, Vladimir Chizhov, told ITAR-TASS immediately after the European Union filed its complaint with the WTO. “Russia will do its best to reach an amicable settlement with the EU concerning its complaint to the WTO, to avoid sanctions,” said Chizhov. The State Duma is ready to consider a bill on the recycling fee in September, the first deputy chairman of the State Duma Committee on Industry, Vladimir Gutenev, said. He believes the bill could become law by November. 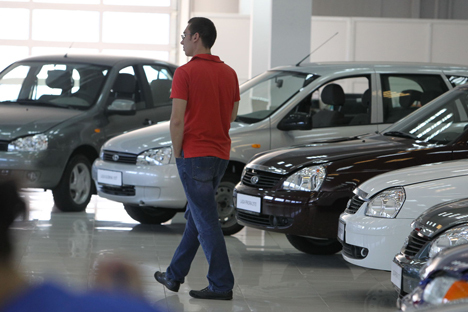 Conditions for domestic and foreign auto manufacturers will be made equal, but the fee could still be adjusted, with step-up rates reduced for new vehicles and unchanged for pre-owned ones, Gutenev said. Based on materials from Vedomosti and Rossiyskaya Gazeta.